Do you know how much food you throw away each week? In Victoria, food waste is a big problem. About 50% of the average household rubbish bin is food being sent to landfill. This is like throwing around $2,000 a year in the bin... or tossing out one in every five bags of shopping you buy. The Food Know How Program is an award-winning program to help you reduce the amount of food you throw away, save money and help protect the environment all at the same time. As I'm sure you all know know, the food going into a landfill produces methane, a powerful greenhouse gas. Cutting down your food waste reduces the amount of methane emitted by our landfills and that benefits your entire community. So..... LESS food waste IS MORE happy communities. ​​Joining the Food Know How Program as a member is easy, FREE and open to all residents of Darebin, Maribyrnong, Moreland, Whittlesea and Yarra Councils. Attendance at a series of free workshops with a celebrity chef to learn top tips on preparing, cooking and storing food to avoid waste. Access to handy tips and tools to help reduce food waste like menu planners, storage guides and loads more. ​Make the most of our precious resources and reduce your environmental food-print! More than half the planet’s population now live in cities, with limited access to the natural world. For Europe and Latin America, the figure is more than 70%. Yet contact with nature has numerous benefits for both our physical and mental health. Gardening is an opportunity for everyone to experience this kind of regular contact with nature, even if they live in built-up areas. For those without a garden of their own, allotments or community gardens are a highly valuable resource. Demand for allotments is increasing and in some locations waiting times have reached as much as 40 years. But gardens shouldn’t just be a luxury for suburban dwellers. A growing body of evidence shows that they can make a significant contribution to our health and well-being, not just as a way to get some physical exercise but also to improve our mental state. There is even some limited evidence that gardening might play a role in helping people to cope with serious health problems such as cancer. This builds a strong case for governments and housebuilders to do more to provide gardens and allotments to as many people as possible. 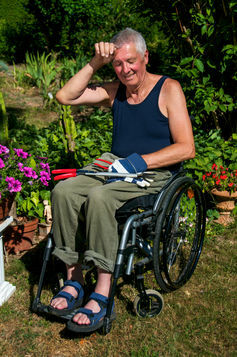 Any type of gardening, whether it is in a home or allotment garden, is an opportunity for physical activity. Gardening is typically seen as moderate intensity exercise equivalent to playing doubles tennis or walking at a speed of 3.5mph, and so carries similar fitness benefits. A survey of 269 people that my colleagues and I recently conducted into allotment gardening found a correlation between gardeners and a lower body mass index. We also found a greater percentage of non-gardeners were classified as overweight. Gardening is also linked to better diets. Home and allotment gardens have long been important for domestic food production, but gardening can also encourage people to eat more healthily and act as an educational resource on nutritious food. In fact, children who take part in gardening and grow their own food have a greater preference for, and increased consumption of, fruit and vegetables. 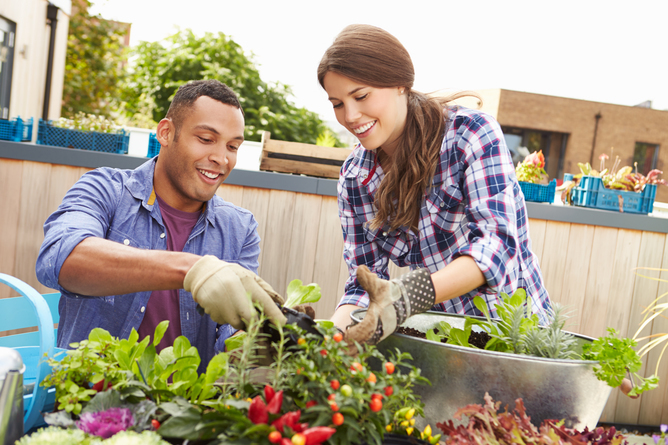 Perhaps less obvious is the positive impact gardening can have on your mental health. Research has shown that gardeners generally have greater life satisfaction, enhanced self-esteem and fewer feelings of depression and fatigue than non-gardeners. But more than this, the act of gardening can specifically improve people’s moods. Asking gardeners about their mood before and after a session on their allotment, participants in our survey reported gardening improved self-esteem and reduce feelings of tension, depression and anger. We saw these benefits no matter how long participants had spent on their allotment in the particular session, in the last seven days or how long they had been gardening for in total. Other research suggests that gardening can increase life satisfaction, and both reduce and promote recovery from stress. In fact, gardening leads to greater reductions in stress following a stress test than either reading indoors or an indoor exercise class. This last point suggests that the mental benefits of gardening may be more than just a side-effect of the physical exercise involved. One possible reason for this is that gardening, particularly on allotments, can involve social interaction and becoming part of a community. Gardeners often share their knowledge, skills and experiences with each other and by doing so develop relationships and support networks. People with strong social networks have an increased life expectancy, greater resilience to stressful life events and fewer visits to the doctor. Gardening also provides essential opportunities for contact with nature, which alone has numerous benefits for our mental health. Spending time outdoors in a natural environment helps us to feel less stressed, reduces the symptoms of depression, and enhances our concentration and attention by allowing us to recover from mental fatigue. All this evidence shows there’s a strong relationship between gardening and health, but we only know for sure that there is correlation, not causation. This means we can’t say that gardening alone is a direct cause of any improvements in health and well-being. We also need to directly examine the immediate effects of gardening on people who have never previously taken part or are suffering from mental and physical ill health. Despite these limitations, there is still enough evidence backing the benefits of gardening to make a case for encouraging more people to take part and for authorities to provide more gardening opportunities through community gardens or allotments. This could have a substantial impact on the health and well-being of the nation and reduce the health costs associated with conditions such as mental illness, obesity and loneliness. Limited places available for 2015 Backyard Harvest Festival (21 – 29 November) Tickets are cheap and selling fast so GET IN QUICK! A reminder that there are still places available for 2015 Backyard Harvest Festival (21 – 29 November) but tickets are selling fast so GET IN QUICK! There are a range of exciting home garden tours and workshops on offer to inspire you to create your own food garden this spring! Tours and workshops cost a measly $10 ($5 Concession), Children are free. BOOKINGS ARE ESSENTIAL as numbers are limited so BOOK NOW! Home garden locations are provided at the time of booking. Ever wanted to grow a variety of fruit but didn't think you had the room for an orchard? Harry will show you how to graft and grow fruit trees in small spaces at a workshop (http://bit.ly/1WQWXop) and tour (http://bit.ly/1QtLJGE). Your next opportunity to influence the future of Moreland's food systems and urban agriculture - NOW! The Moreland community does a range of exciting work in relation to food, including growing at home, social enterprise, community gardens, free food events, food swaps, food festivals and more. We are currently developing a strategy to support these kinds of initiatives in the future. From July through to September of 2015, a group of community members met to have input into the strategy. Council staff and other organisations were also asked for their input. Read more about the process we undertook in Seeding Change: The Moreland Food System Framework (PDF 14Mb). into the strategy at the first meeting. A vibrant food system that protects and nurtures food, culture celebrates diversity and builds community. Council noted the development of a framework, and asked to receive a further report and the draft strategy, including recommended initiatives and resources implications in February 2016. Council also asked for staff to progress actions in relation to information provision and place-based project work in the coming months. View The Moreland Urban Agriculture and Food Production Framework (PDF 2Mb). You can watch the 7 October Council meeting on the live streaming page (the relevant discussion starts at 10 minutes and 15 seconds). We would like to hear your thoughts about what should go into the strategy to help us to achieve the three goals. Our two surveys - linked below - are a chance for you to have your say about anything relating food systems, including food growing, urban agriculture, food festivals and celebrations, food waste, buying local food and more. Community survey - Fill out the community survey if you are a resident representing yourself. Stakeholder survey - Fill out the stakeholder survey if you represent a business, community group, club or organisation. Keep your eye on this page - we will update it to keep you informed about opportunities to get involved. If you want to be contacted when there is new information, email Urban Agriculture with your contact details. Below is an outline of the process up until February 2016. November/December 2015 - Community, council staff and partners can provide feedback about what could go into the strategy. You can provide your feedback to Council via our surveys (link above), and at local events, including the Fawkner Festa in November and the Coburg Night Market in December. February 2016 - Draft strategy goes to Council. April 2016 - Pending the outcome of the Council meeting, community members and organisations will have an opportunity to provide formal feedback on the draft strategy. For any questions about Council’s work in developing this strategy, or if you wish to be kept informed of opportunities to be involved, email Urban Agriculture or call 9240 2484. I experience bouts of council envy every year when this festival approaches. Held annually in November, the Backyard Harvest Festival is a celebration of home food growing traditions. Learn from passionate and knowledgeable local experts from a diversity of cultures. Visit home gardens, participate in gardening workshops and get inspired to create your own food garden this spring! The festival is being held from Saturday 21 - Sunday 29 November, 2015 on weekends and early evenings during the week. This year 16 of Darebin’s residential fruit and vegetable gardens will be open for display, and there are six different workshops to attend on everything from permaculture, aquaponics to backyard beekeeping and tree grafting. Tours and workshops cost $10 ($5 Concession) Children are free. Are you interested in volunteering or opening your garden at the next festival? Click here to fill out the on-line expression of interest form or visit any Customer Service Centre to request a hard copy version.